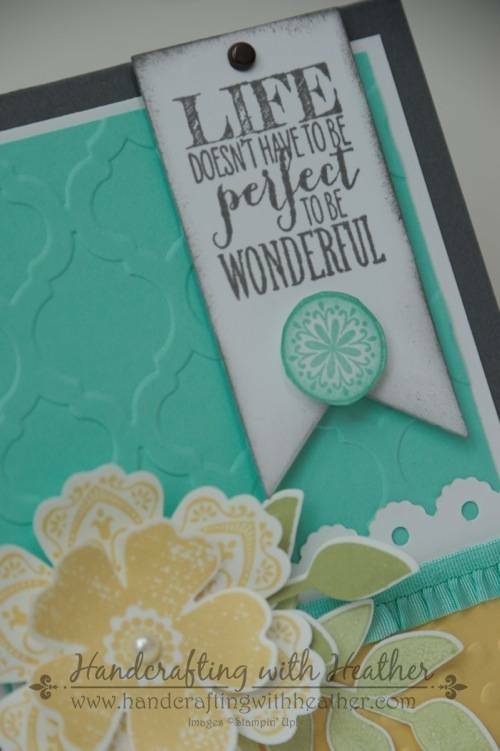 Life is Wonderful with Perfect Pennants and Mixed Bunch from Stampin’ Up! 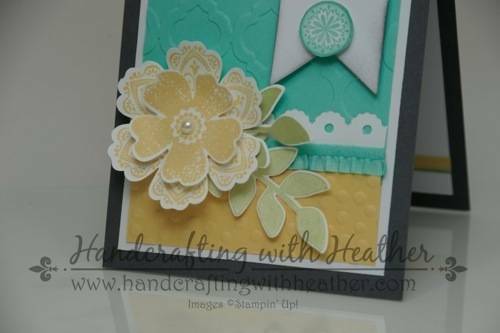 My card today was created using the Perfect Pennants, Mixed Bunch, and Flower Shop stamp sets from Stampin’ Up! 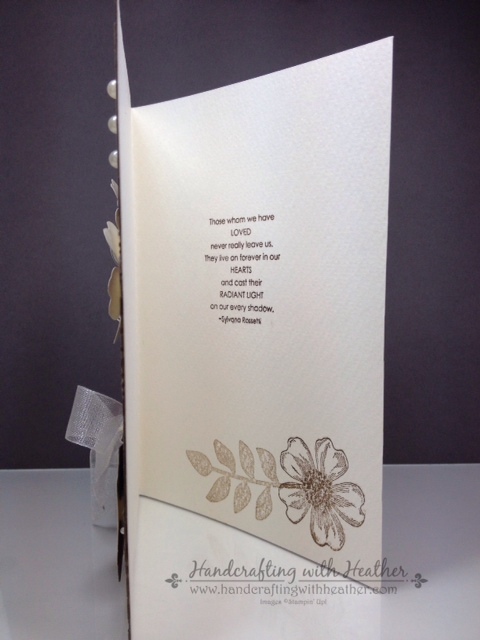 It also features the Modern Mosaic and Decorative Dots (Sale-a-bration item) embossing folders. 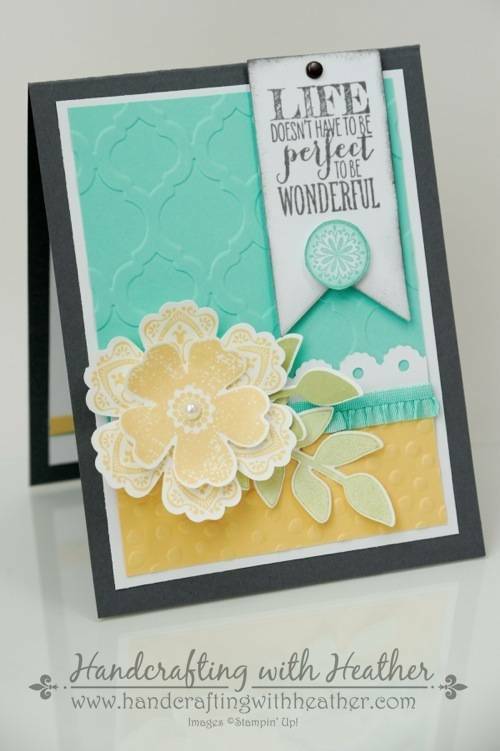 The Decorative Dots embossing folder is one of my favorite items available FREE with a $50 purchase through March 31st! There are just so many things you can create with that cute design. So, if you love this card and want to get some of the supplies, now is a great time. For your convenience, I have hyperlinked the names of products to my online store… just click and you’ll be on your way to creating this beautiful card too! I started my creation by cutting panels of Whisper White, Coastal Cabana and So Saffron card stock. Next, I dry embossed the Coastal Cabana and So Saffron panels using the Modern Mosaic and Decorative Dots embossing folders using my Big Shot Die-Cut Machine. Then, I added some Coastal Cabana Stretch Ruffle Trim to the top of the yellow panel with SNAIL adhesive. I used the Adorning Accents Edgelits to cut a scalloped strip of Whisper White card stock, and I used a small hole punch to create a hole at each scallop to give my trim an eyelet lace effect. Finally, I adhered it to the bottom of the Coastal Cabana panel and layered all of my panels on a Basic Gray card base. After stamping the greeting, I used a sponge dauber to apply ink to the edges of my banner for a little added contrast. 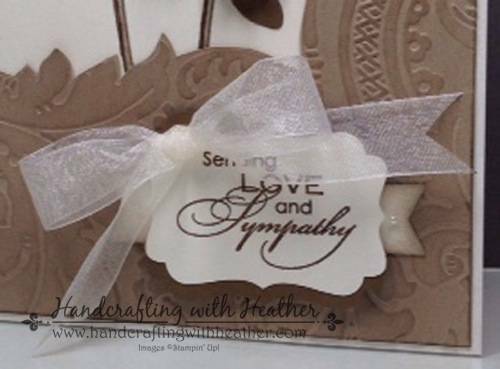 I attached a brad from the Vintage Trinkets accents and elements set to the top of the banner and stuck it to the front of my card using Stampin’ Dimensionals. I stamped two round medallions using my Coastal Cabana Classic Stampin’ Pad and inked around the edges after I cut them out. Then I attached one of them to the bottom of the banner using Stampin’ Dimensionals. I set the other one aside to use on the inside of my card later. 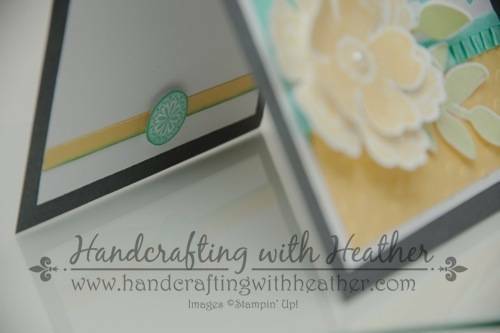 For my flower, I used my So Saffron Classic Stampin’ Pad to stamp a large flower using the Mixed Bunch stamp set (wood mount and clear mount) and a small flower using the Flower Shop stamp set (wood mount and clear mount). Then I punched out the flowers using the Blossom Punch and the Pansy Punch. (The Flower Shop stamp set and Pansy Punch are available as a bundle for 15% discount off the regular price. Available in wood mount and clear mount). The leaves of the flower were stamped using the leaf stamp from the Secret Garden stamp set (wood mount and clear mount) and my Pear Pizzazz Classic Stampin’ Pad. I inked up my leaf stamp and then stamped it twice without re-inking between stamps. This gave my design some added dimension and contrast. Then I used the Secret Garden Framelits Dies to cut out the leaf images. 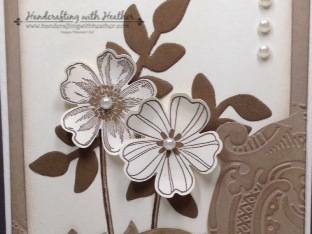 Finally, I attached my leaves with Glue Dots and layered my flowers using Stampin’ Dimensionals. The center of the flower was finished by adding a large pearl from the Basic Pearls Jewel Accents. I finished the inside of my card by adding a panel of Whisper White card stock with a strip of So Saffron card stock along the bottom. I brushed Coastal Cabana ink along the bottom edge of the trim using a sponge dauber to give it some extra contrast. Then I attached the second medallion I created earlier to the center of the yellow strip using Stampin’ Dimensionals. I hope you have enjoyed my share today. I certainly enjoyed creating it. I just love the color combination. I know that someone special will enjoy receiving it at just the right moment. If you would like to order the Perfect Pennants, Mixed Bunch, or Flower Shop stamp sets and earn the Decorative Dots embossing folder for FREE (Sale-a-bration item), please click here to shop in my online store. Stampin’ Up! has updated the Clearance Rack in the online store! 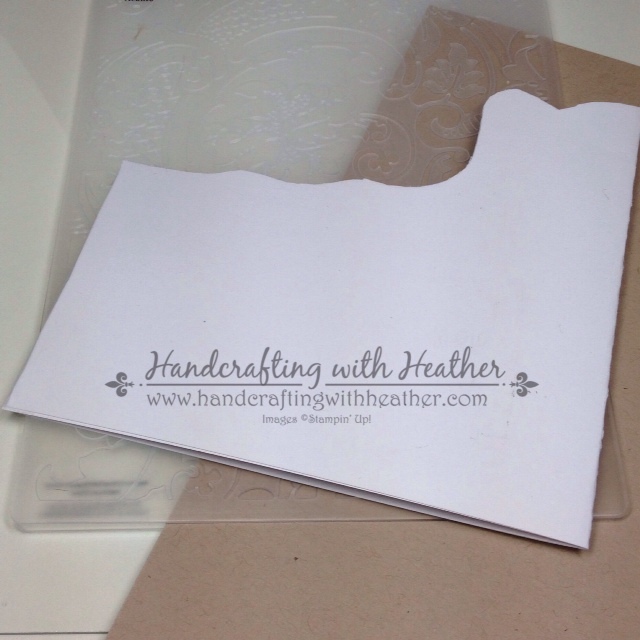 I saw some punches, dies, card stock, DSP and embellishments at great deals. And Clearance Rack items count toward your merchandise total for Sale-a-bration items!! So click here to head over and start shopping now! Clearance Rack deals are only available while supplies last. Card Stock: Basic Gray (121044) – 4-14″ x 11″ card base; Whisper White (100730) – two 3-3/4″ x 5″ panels (front and inside of card), one greeting (Banners Collection Framelits), strip for Adorning Accents Edgelits trim, two flowers, two leaves, two small medallions; Coastal Cabana (130024) – 3-1/2″ x 3-1/2″ panel; So Saffron (105118) – 3-1/2″ x 1-1/2″ panel, and 1/4″ x 3-3/4″ strip for inside of card.